This is a great value, all-inclusive property with access to some of the best skiing in France. Positioned a walking distance from town the hotel is one of the few properties in Chamonix with ski-in access. The bus stop to further reaches of the resort is also just a short distance from the hotel. The property offers great views of the surrounding mountains best viewed from the light and spacious dining rooms or relaxing in the heated outdoor pool and spa area, a must after a big day playing on these big slopes. Challenging the elements, the majestic former grand hotel stands proud at the foot of Mont Blanc where the refinement and luxury of a bygone era have been renewed thanks to the talent and originality of the interior designer Jacques Garcia. A feeling of well-being reigns over the whole hotel, amplified by the hypnotic view over Mont Blanc. A grandiose refuge that encourages the telling of breathtaking adventures of the first Alpine climbers taking on the challenge of the Drus and Grandes Jorasses. Lovers of fitness and the mountains will be indulged here with fresh air and fulfilment. 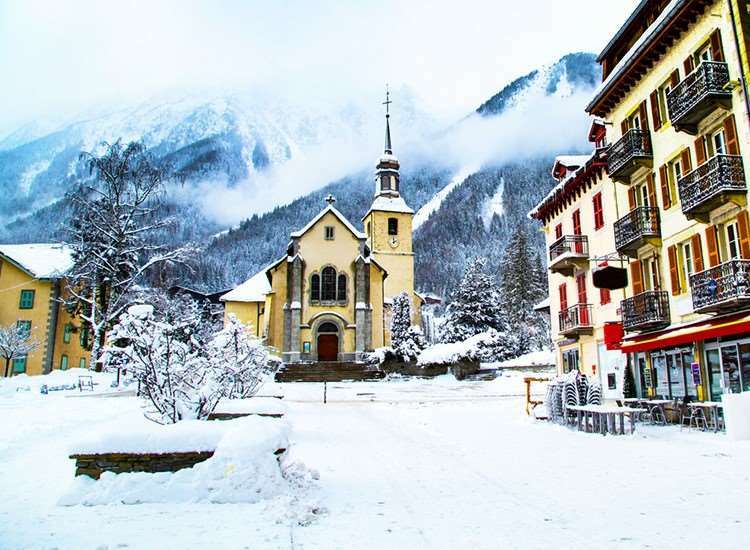 The Resort has 260 rooms in 3 hotels, less than 5 minutes walking distance from the centre of Chamonix. The Savoy is the main hotel, a 5-storey building with lift that houses the restaurant, bar and Reception. The second hotel is the Mont Blanc, also 5 floors with lift, adjoining the Savoy. The Brévent is a new, 4-storey hotel with lift that houses the Club Med Spa, and has direct access to the outdoor pool. It is linked to the other two hotels by a covered walkway. Club Room- The "Mont Blanc" Club Room offers you a good level of comfort with the equipment and services essential for your well-being. All including European electrical plugs / 220 Volts, Flat-screen television, Hair-dryer, Security safe(s), Shower room and Telephone. Deluxe Room - A magnificent room with a sitting room area and elegant decoration for unforgettable moments of relaxation, facing Mont Blanc, with a view of the Mont Blanc or the Brévent. All including European electrical plugs / 220 Volts, Flat-screen television, Hair-dryer, Heated towel rail, Ironing kit, Minibar, Security safe(s), Shower room, Tea and coffee kit and Telephone. If you're unfit and lazy don't go here. Many people go on about having to get a bus, it really doesn't matter, the buses are so regular and it's a good time to strategise your day, everyone's in the same boat you just have to get on with it. The mountains in Chamonix look amazing, photographers go crazy in Cham. Going with a guide and doing Valley Blanche is a must from the top of the Aguille Midi, it's something you have to do in your life time. You're reward for a scary roped up entrance will be glacial sites, skiing away from any traffic and people and finishing off with a mountain train ride back to a pub in Chamonix, mountain refuge stop on the way for lunch. Club Med in Chamonix is a good base, very central and for those that like eating prepare yourself (try not to eat anything the week before). If you think you're the best skier or board then think again..... someone in Cham will have bigger skis than you, skied deeper, gone faster or jumped further let alone climbed higher... Do it! After skiing for twenty years I found the best holiday I've had at club med Chamonix. The food was delicious, so much choice and very helpful staff. Our guide was the beautiful Britt, who could not do enough for us. She gave instruction all day with a smile and laughter. Lunch on the slopes in Club Meds own chalet was a great bonus for us meeting all the skiers from the hotel and enjoying a drink with Mount Blanc in the background. After a days skiing a few more drinks and snacks all included. A dip in the outdoor pool before dinner. And then entertainment with the hotel's staff. It's you again next year Club marvelous Med.